Currently, libraries are passing through a challenging phase of progress as the entire scholarly publishing process is getting through the publisher's remote servers from the stage of production to users accessing the information. The server log created in this process measures their usage in several dimensions. 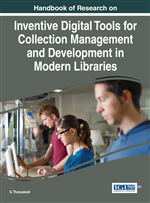 As libraries strive to become more user-centric, usability factor becomes increasingly important for the development of collection as well as services. Consequently, the need is arising to explore methods to evaluate the usefulness of new type of resources also since they became integral part of the library collection. The subscribing libraries, organizations and consortia have been relying on the data for quantitative as well as qualitative assessment. The chapter discusses about the characteristics of electronic information, genesis of server logs and transformation into usage metrics and also the role of relevant standards in formatting the usage standards and advantageous features. The objectivity of data mining and research applications of usage metrics in supporting the library management as well as establishing the credibility of authors, institutions, journals or databases etc. are highlighted in this chapter. The scholarly information, especially serials began produced, preserved in electronic medium and distributed through networks. The initial efforts to resolve the issues arising through traditional means of scholarly communication and the dissemination of information gave a way to the present developments in transmitting the scholarly content through electronic form using satellite communication channels. In very early stages, McMillan (1991) defined electronic journal that “any serial produced, published and distributed nationally and internationally via electronic networks such as Bitnet and the Internet”. Lancaster (1995) further clarified that “the electronic journal is the one created for the electronic medium and available only in this medium”. Tenopir and others (2003) described the evolution of e-resources in three phases commencing from the late 1970s. Though the journal format was shifting from print to electronic was minimal until early 1990s, publishers started massive publication of electronic journals on the Web in parallel with the traditional printed versions and their distribution over the Internet after the invention of the World Wide Web in 1993. The advanced a third phase is characterized by the placement of e-journals in a full digital context, i.e. the search capabilities and other advanced features were integrated since the year 2000. Further technological advancements in the integration of multiple resources and sources made it possible to aggregate the full text resources and form as collections or databases; the abstract & index services and also the development of consortia, gateways, digital libraries etc. Standardized Usage Statistics Harvesting Initiative (SUSHI) Metrics: The SUSHI protocol is a standard client/server web service. It can be used by electronic resource management (ERM) systems to automate the transport of COUNTER formatted usage statistics. Web Mining: Web mining is the application of data mining techniques to discover patterns of information or data on the Web. Counter Statistics: COUNTER (Counting Online Usage of Networked Electronic Resources) is an international initiative serving librarians, publishers and intermediaries by setting standards that facilitate the recording and reporting of online usage statistics in a consistent, credible and compatible way. Transaction Log Data: the files created on the data server at every users access or transaction represent some data or information about it. Client Server Interaction: The server software programs to deliver the content to clients as HTML web pages and in various other file formats through browsers on receiving requests from web browsers (clients). Usage Metrics: The term ‘metrics’ refers the ‘measure’. The server log files are labeled as usage metrics, since they reflect the real usage of electronic documents in terms of counts. Data Mining: An analytic process, designed to explore data. Webserver: is a computer system that is connected through the network or groups of networks, storing and hosting the content for disseminating to the connected users. Scholarly Content: The scientifically approved or peer-reviewed information, material embodied in a document/s in the form of text or in other than text form.